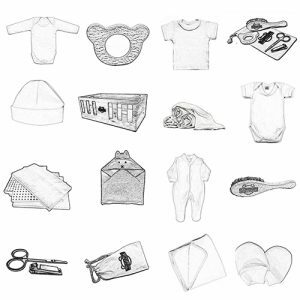 The BabyCrate Natural Newborn Starter Set provides a selection of essential, high quality items to get ready for a new baby. 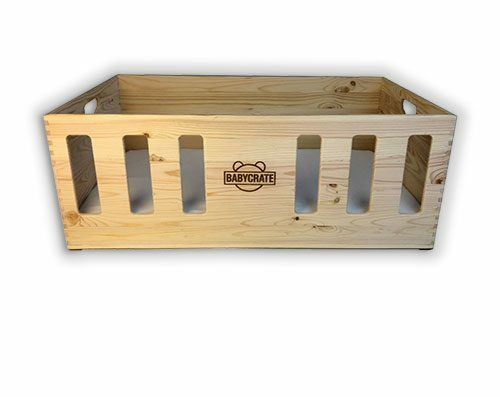 20 high quality all-natural products in the gorgeous BabyCrate Safe Sleep Crate. The BabyCrate Natural Newborn Set combines the natural safety of the BabyCrate with exceptional, high quality natural products to give your newborn a completely natural start in life. Everything in the maternity package is made of 100% natural materials. All our GOTS Certified Organic Cotton newborn clothing is extra soft and thick and provides all the essentials for your newborn. The BabyCrate is a safe place to sleep for your newborn, during the day and at night. Made from natural pine, this portable minicrib is designed according to the latest guidelines for a safe sleep place. No need to worry about shipping rates. We deliver your BabyCrate for free. If you change your mind about the BabyCrate you may return it within 30 days (postage stamp date) and we will refund the full purchase price. Absolutely Gorgeous – really love the crate! We got a customized BabyCrate with all the trimmings for our newborn baby girl and we absolutely love it. Took it on an overnighter to the Grandparents last weekend and it was even useful to carry all the newborn stuff I needed to take out to the car. We got this as a present from the in-laws and at first I was admittedly a bit sceptical. But bubs loves it and we use it all the time now. I really like the simple no frills design it would be great to be able to buy a stand though. The organic cotton clothes are great quality and the bed is cute, robust and very practical. My husband bought this as soon as he found out that I am pregnant. At first I wasn’t sure what to think but now that the baby is here we use it as the main sleeping space for our little one. I really like the fact that it is all-natural and organic. I like the maternity package things too, especially the brush. It is a really nice brush. I am so tired right now but I came here to say that when I put my darling to sleep I feel that she is safe in the BabyCrate. Everything in the set is gorgeous and great quality but the sleep suit is just too big – almost like a sleeping bag but not tight enough so I prefer to swaddle.